The extensive ridge dominating over Europe is slowly transforming into an omega blocking pattern. E Atlantic and Iberian peninsula are under a large upper low and surface cyclone while a deep trough and surface low moves across W Russia towards the Black sea. 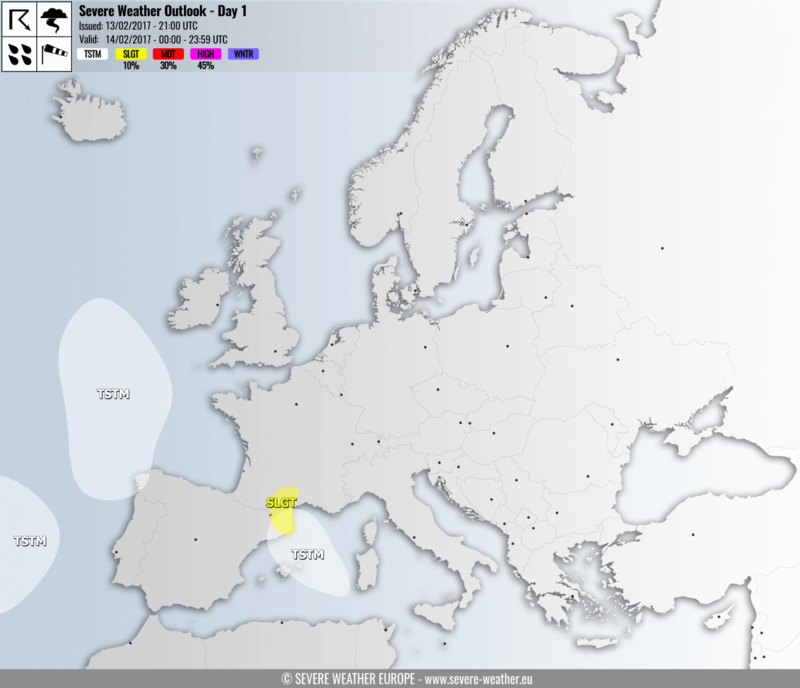 A SLGT risk has been issued for extreme S France and E Pyrenees with threat for excessive rainfall. 70-120 mm is possible within the 24 hour period. Combined with some instability and strong ESE winds, some organized storms are possible along the coastal areas, marginal threat for hail and strong winds exists. TSTM areas have been issued for NW Mediterranean and NW of Iberian peninsula where scattered sub-severe storms are expected. With some better shear in place, briefly organized storms with strong winds threat are possible over extreme NW Spain.